Hello and happy Tuesday. It's time for another challenge at CASology. 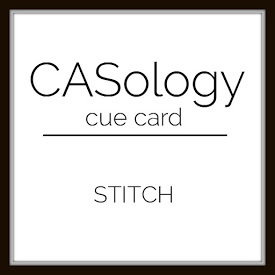 This week, our cue word is Stitch. I pulled out a real oldie but goodie for this card--remember PTI Button Boutique? I decided to make a baby card featuring buttons--something you would stitch on--and faux stitching two ways. I used a die to put faux stitches around the top panel of my card, and a stamp to add some faux stitches to my focal point. Now, it's your turn. How does STITCH inspire you? I hope you play along this week. Please remember to keep it Clean and Simple. Love this Joyce! Feels Kay Miller inspired to me. Love all the details. Joyce, this is so adorable! That is an oldie but goodie set. I think I need to pull mine out and play too! You already know I love this one Joyce! It is such a sweet set and you did it CAS! Such a cute card, Joyce! Your buttons are so sweet, and I love the stitched border...so charming! Ohhhhhh....so fun and it looks just as fabulous on my screen as it did when I was there watching you make your card. I love those sweet little buttons!!! What a delightful take on the cue word Joyce, this is so sweet!! Oh I love this!! the stitched die you used was a brilliant choice! Oh how pretty!! That stamp and dies set is PERFECT for this challenge. LOVE it!! So fun to see Button Boutique pulled out again. So pretty! What an absolutely perfect take on the cue!!!! Love it!